Let’s face it: most of your old blog posts are aging like milk, not wine. At this point, you’ve probably spent a lot of time creating content. It took you months (maybe even years) to publish all those high-quality blog posts. There’s just one problem: some of that content hasn’t aged well. As a general rule, people are going to gravitate towards the blog posts you published this week and away from the ones you published a year ago. So, that amazing post you published that broke down basic SEO? No one’s reading it because it’s four years old. 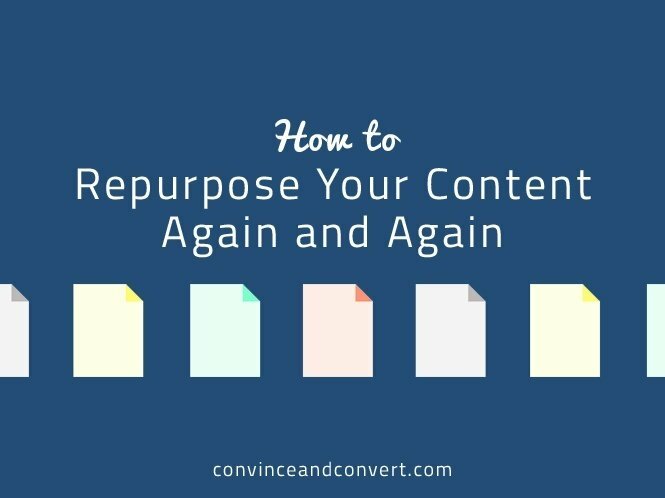 Forget about the timeless content you’ve published—that’s easy to repurpose. What about those blog posts that talk about outdated techniques? Information (especially when it relates to content marketing) is always changing and evolving. What was gospel six months ago could easily be a gimmick today. That’s just the nature of this business. Fortunately for you, the process of repurposing can make those older blog posts relevant, valuable, and (with a little luck) profitable. The easiest way to start repurposing is by turning to your evergreen content. These are the blog posts that are traffic magnets: relevant, poignant posts that will never go out of style. If you have some of these posts just sitting in your archives, you’re missing out on a sizable chunk of potential traffic. Generally, these are the posts that offer just as much value today as they did when you published them. If you happen to find any of these gems, repost them on social media (Twitter, Pinterest, Facebook, etc.). The idea of reposting content that people have already seen might rub you the wrong way, but think of it this way: Has your business grown within the last 6 months? If so, there’s a good chance that your content is going to be reaching a new audience. Speaking of reusing great content, don’t be afraid to repost your most popular content. It’s shocking how little this strategy is used. Everyone has a “Most Popular” tab on their website, but for some reason, people are terrified of sharing any old content with their audience (even if their site analytics prove that the post was well-received). One of the benefits of having older content (especially content that your audience has liked) is being able to use it as inspiration for your next project. New ideas are important, but you should also be embracing concepts that people are clearly interested in. In fact, those are the ideas you should be using to expand your audience. Here’s what we’re talking about: imagine that you wrote an article titled “How Social Media Can Help Entrepreneurs.” Even after six months, it’s still one of your popular pieces of content. If your content has performed well, build on that success! With your understanding of the core themes (social media, in this case), you can easily create content that provides value to a different market. Creating an article titled “How Social Media Can Help Artists and Creatives” wouldn’t just be easy, it would engage an entirely new market and help develop your brand in the process. By repositioning your content, you’ll be able to engage new people, convert more, and get even more feedback from the people you care about: your audience. These days, most businesses understand the importance of providing their audience with high-quality content. That’s one of the huge rules of successful marketing strategies: give before you get. Offer your audience value, and they might just pay attention to you. Yet, businesses all over the world are ignoring one of the greatest benefits of having great content: being able to engage your audience through it. If your audience has given you a ton of positive feedback for some content you posted, you can make a follow-up piece thanking them for their support. Ever heard of user-generated content (UGC)? Something as easy as launching a hashtag campaign on Twitter, Facebook, or Instagram and promoting that fan-made content can quickly turn your audience into a community. Remember: giving your audience a place to voice their opinions is great. But actively engaging with them (having a conversation with them, posting their content, thanking them for their praise) and making them feel like a part of a community is what keeps people coming back for more. As you’re reviewing your blog content, you may come across some posts that had plenty of potential at the time but aren’t completely accurate today. Change happens, after all. If that’s the case, feel free to update those posts with new information. Share those updated posts with your audience, and you’ll be able to salvage those great ideas and make them valuable again. Beyond just getting more traffic out of an older blog post, reposting can actually be a valuable social media management tool (testing out new headlines, what time to release your content, etc.) The more you post, the more accurate your site analytics become. If you’re feeling particularly adventurous, you could even change the format of your content. By creating a SlideShare, adding an infographic, or making a short video, you’re able to engage your audience in a new way with content that would’ve otherwise gone unseen. A slightly out-of-date blog post is usually easy to touch-up and present to your audience. But let’s say you find a blog post that had a great headline… and not much else. If that’s the case, you may want to repurpose that content by using it as inspiration for a new article. When it comes to reposting (and repurposing, in general), the focus should be on efficiency. Should you consistently be pumping out fresh, engaging content? Of course. But exposing your audience to older blog posts should be just as important. You have plenty of content already—why not make the most of it?